In buffets, the server does not do as much work as their counterpart in a sit-down restaurant. However, this does not mean that you can just choose not to tip anymore. After all, you are still fed and served. Buffets can differ, and so does your tip amount. Here are some scenarios you may encounter when tipping buffet servers. - Buffets in different places operate and distribute diner tips in various ways. This is why it is often up to you to see the amount of work your wait staff does. Pay attention to see if they are doing all the tasks needed to fulfill your requests. - You may also feel free to ask about how tips are shared (if at all) by the staff. In some buffet places, food runners (those guys who refill the chafing dishes at the buffet) get a share of the tip. - There is also staff that works behind the scenes and deserve some gratuity as well. These are buffet employees who clean up tables and re-stock napkins and cutlery, among others. - Ultimately, observe the golden rule of tipping: Always tip, and tip very well for excellent service. One common way of tipping servers in buffet restaurants is by following the 10% rule. This is the buffet counterpart of sit-down restaurants’ standard 15%-20% gratuity range. Needless to say, the discrepancy is due to the considerable difference between the work that buffet servers do versus that of their counterparts in normal restaurants. In common buffet restaurants, the server may bring napkins, cutlery, and beverages. They may refill drinks and take away used plates as necessary also. Some would deliver such items as sauces or coffee but not unless you ask them to. By contrast, servers in sit-down restaurants do all of those plus take and deliver food and beverage orders from and to your table. They even check up on you from time to time during your meal to see if everything is okay and whether there is anything they can do for you. Nonetheless, you may do the 15%-20% standard for buffet servers that go above and beyond and therefore deserve such a sizable tip. With buffets, gratuity is commonly not added to the bill, unlike in sit-down restaurants. However, they may add it for groups that are bigger than a standard table. For example, if you notice in the buffet restaurant that the booths and tables seat 5 and you are 6 or 7 in your group then chances are, they might add gratuity to your bill. Buffet places that do this typically have a sign in the restaurant itself or on their website notifying patrons about the policy. Feel free to ask when in doubt. If the place already has gratuity added, do not feel obliged or pressured into leaving a tip, but you are still free to do so if you found the service exceptional. In buffet restaurants where the servers do very little work, base the amount of your tip (or whether you are going to tip at all) on the actual work your server does. For example, if the place has a beverage station that is open for self-service, then that means your server needs to bring and take away plates and cutlery only and not much else. In this case, a $1 tip appears to be suitable. Nonetheless, do add a bit more if you feel that the server exceeded your expectations. 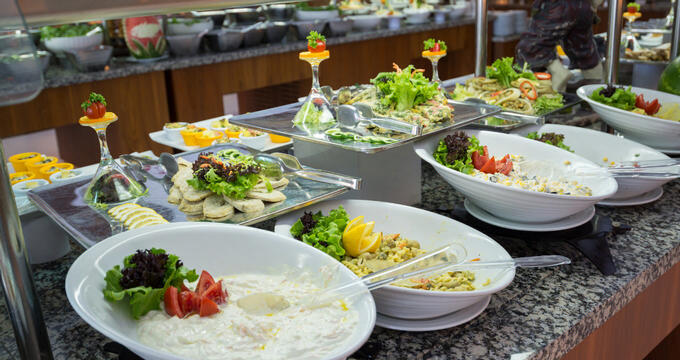 For many diners in buffet restaurants, it is much easier to just tip a specific dollar amount instead of calculating the tip as a percentage of the total bill. In general, you can tip $1 to $2 per head served in your party. Give the minimum if the server is hardly available when you need them and/or does basic tasks only. By contrast, do tip $2 or a little more if the server delivered additional items to your table, such as plates, cutlery, food, and drinks. Opt for this amount as well if your server is particularly courteous, friendly, and accommodating despite a busy night or goes the extra mile in serving your group. There are different types of buffets, and you can tip in various ways too. Given that a buffet server does not do as much work as does a sit-down restaurant server, you do not have to follow the standard 15%-20% amount. However, by all means, do not hesitate to reward exceptional service.